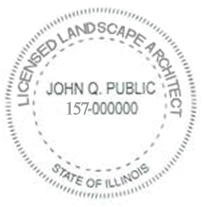 a) Every licensed landscape architect shall have a reproducible seal, or facsimile, the impression of which shall contain the name of the landscape architect, the license number, and words "Landscape Architect, State of Illinois". Plans, specifications and reports related to landscape architectural practice and prepared by the landscape architect, or under his or her supervision, shall be stamped with his or her seal when filed. A landscape architect's license must be in full force and effect in order to seal documents. The seal, signature and dates may be electronically affixed.